The City has recently embarked on a year-long process to do what so obviously needs to be done in South Lake Union: upzone. Last December, keeping Amazon in town was deemed important enough to ram through the upzone of two blocks for 160-foot buildings. But for a neighborhood-wide rezone, a full-blown Environmental Impact Statement (EIS) is required. As the zoning map above shows, allowed building heights drop precipitously once you move north across Denny Way and enter SLU (border in light blue). With the exception of the narrow strip of SM-125 along Denny, the allowed heights in SLU are roughly comparable to Seattle urban villages such Ballard. But SLU is not your typical Seattle urban village. It’s on downtown’s doorstep. It’s hemmed in by Seattle’s two major north-south roadways, on the east by I-5, and on the west by Highway 99. It’s highly urbanized and packed with commercial and industrial uses, but has relatively little residential (though that’s been increasing in recent years). To the north it borders some low-rise residential zones, but it doesn’t come close to any of our sacred single-family zones. Furthermore, SLU is in a valley, lessening the impact that tall buildings have on the viewsheds from surrounding areas. And let’s not forget that we just paid for a new streetcar through the neighborhood that needs lots more density to justify its existence. 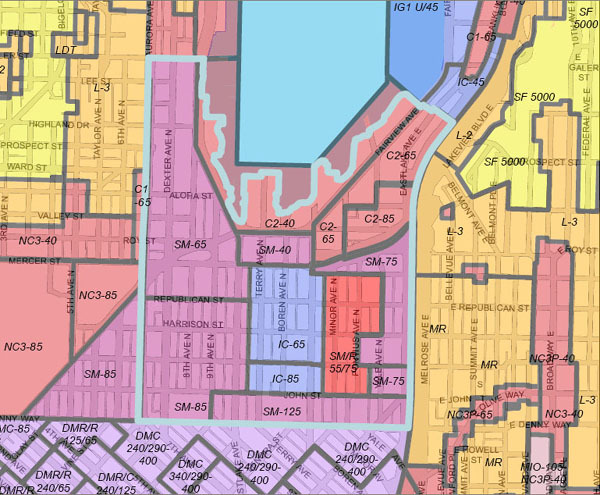 There is no other neighborhood outside of downtown where upzoning is such a no-brainer. That is not to say these changes would have no downside: Change is impossible without disruption. Lack of affordable housing and loss of commerical and industrial uses are the two main risks. But given the current state of the world, this risk doesn’t justify halting densification. Our challenge is to find a way to increase density while preserving what we value. So far the City has held an urban form charette, during which a set of development scenarios (big pdf) were defined in order to provide a basis for the EIS. The image below illustrates the “Parks Focus” option, wherein the densest development is clustered around Lake Union Park and Denny Park. Building forms have been simplified to three typologies: 65–85′ “breadloafs,” 125–160′ “wedding cakes,” and 240–400′ towers. Note that with no upzone, we would end up with a district of breadloafs, similar in massing to the Alley 24 buildings across the street from REI. It is certain that the task of determining the optimum zoning arrangement will be both complex and controversial. But let’s not be timid, as in, why not upzone the whole damn thing up to 400 feet? Cause Planet Earth is jonesin for a fix of smarter urban development. Posted by dan bertolet on	Friday, February 15th, 2008 at 11:58 pm. You can follow any responses to this entry through the RSS 2.0 feed. You can leave a response, or trackback from your own site. Amen. I’d love to see the whole thing zoned to 400′. Which option of the three proposed did you prefer? The “Transit Corridors and Nodes” option looked like it allowed for the most development, but it’s hard to tell from a little drawing. The current state of the world suggests that local industry will be more important, not less. Lack of affordable housing just creates more commuters. Actually, lack of housing creates more commuters. Stopping new urban housing on the grounds it is not affordable enough is a recipe for more commuters. And lack of housing is one of the reasons why housing is unaffordable. Seems to me we can both increase housing in South Lake Union, and increase the supply of affordable housing if we are smart about it. I think the whole city has this problem with too low heights. The max in downtown is only 500feet through most of it. San Francisco, on the other hand is building dozesn of 900+ tall buildings (the tallest there now is only 850). 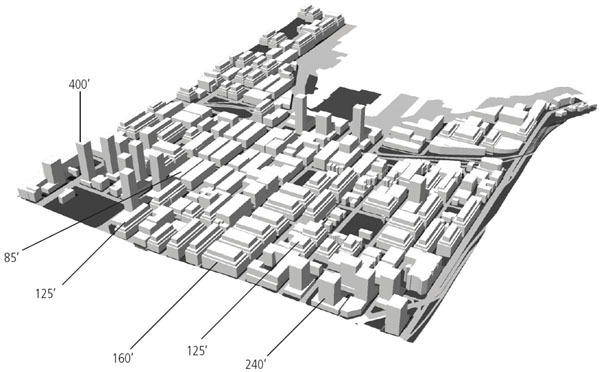 Then there’s SLU with short maxes, and then the whole “urban village” zoning of 40~65 never made sense to me. Why 40? that’s 3.5 stories. And why only 65? Why not 85 like in ballard or the UD? The whole city should be zoned 45, with urban villages at 120 and Downtown at 1000 feet. So, you’all are in such violent agreement that everything should be taller – what’s the hold up? Why do the Powers That Be not see your Wisdom? I will tell you exactly why the zoning has been so low. The damn Space Needle!! Has no one taken into account the fact that if you put 400ft buildings all through South Lake Union we will essentially lose the beautiful skyline that we have. From across Lake Union (ei U-district, Wallingford, Gasworks) you would probably just barely see the top and from West Seattle the beauty of the city next to the Needle will be entirely changed. The Needle will be much less prominent. I am all for SOME urban density but lets just be a little cautious before we through up a million more condos into downtown. It’s the Powers-That-Are-Not that don’t see our wisdom. Some of these have legitimate concerns such as affordable housing. But most seem to be either paranoid about developers, or simply against any growth in Seattle. This is the same conservative attitude that killed the SLU Seattle Commons back in the early 90s, and generally leads to watered down, compromised development all through Seattle. I always thought that the City should just force developers to put 10% into affordable housing, then they could just build it everywhere b/c they’d have enough money. I understand that some do not want to lose the Space Needle in the mess, but is this worth an incredible lack of housing downtown? It is quite possible that if we had more upzoned land we would get more residential towers because the land cost component would not be as large. As for affordable housing, I basically agree with Andrew about 10%, but my thoughts are also go a step further: Lets say that developers build strictly luxury housing in SLU. Then, all of the people that can afford this housing move out of their current places, leaving those places for the semi-luxury folks, who move out of their places… and on down the line until eventually I get to move up one notch – or at least not move down one the next time rents spike. In fact, in order to encourage them to start with the towers, I would upzone the eastern portion of the area to unlimited height, and step it down going to the water. Yes, yes, I know that a few people on the hill would lose their view, but we are paying a hell of a price to keep it. Make your money you spend on Gasoline go Farther Click Here! To see how….